But, as all good soldiers know many times appearance’s aren’t what they appear to be. The only one left to lead C-Group now was Corporal McMurty. All of the officers were either dead or too badly wounded to walk or talk much less plan an attack and lead these men. Now, the Corporal found himself in a position of leadership that he never had and never wanted. “Show me an officer” McMurtry would say, “and I’ll show you a dead officer”. Looks like McMurtry was right, at least for this day he was. “Well Mac, what are we going to do? 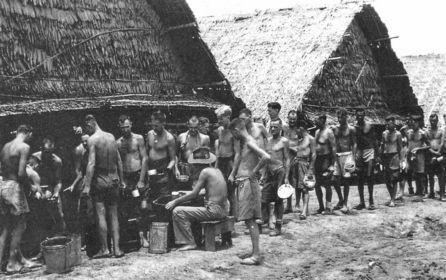 We have one hundred Japs dug in somewhere in or around this camp and we have to to through here, not around, under or over, but through them, if we are going to make the airlift on time”, Private Sloan said to “Mac”, McMurtry. I know, I know Sloan, give me some time to think this through. I have a plan in mind but need to be sure we can pull it off. Unless you want to do the planning and decision making. Oh no, not me. Get some other sucker to stick his head up and get it blown off. I don’t get paid enough to to do that kind of stuff. Just tell me what to do and point me in the right direction, said Sloan, and say “Go”, and I’ll go but, uh uh, I’m not taking charge of this group. That’s your job now. Yeah I know private, I know. Corporal McMurty’s brow was dripping sweat into his eyes now, stinging like an salty ocean water. Wipe it away, concentrate, he thought. We know about the tunnel the POW’s dug underneath their prison barracks straight ahead. The few guys who escaped told us about them. All the other buildings have been cleared and because we already got all of the men out who could be gotten out, then their Captain Sagati’s troops must be in that tunnel. That’s the only place they could hide, hold up and then possibly escape at nightfall because none of our POW men know where the heck the tunnel comes out. Sounds like a good plan Mac, said Sloan. No, No Mac. Not the whole camp. One hundred yards,yes but, only around the POW barracks. That’s where the tunnel starts. You’re right Sloan and we just need to be ready at the end of the tunnel when these monkeys come out. Now you’re thinking like a Captain Corporal. We are probably going to take some casualties Sloan. Maybe heavy casualties unless we can find a way to trap them in that tunnel and deal with them before they get out, Mac said. Mac, we all know that. We wouldn’t be here no matter who was out in front leading us. We are all here because of those men we got out of there and because of that wretched bunch in that tunnel who think of themselves as “Imperial” soldiers. They are nothing short of evil, Mac, and we are all behind you. No we are all beside you and with you. We have your back Sir so, lead on. ~ by Vinnie on July 12, 2009.